No matter who you support, it's beyond doubt that Barcelona have been the most dominant team in the Champions League since Juventus in the late 90's. Their style of play is not just extremely watchable but is also vey effective - as Sir Alex Ferguson called it, it's "the passing carousel". Josep Guardiola was at the forefront when Barcelona became the force they are today. Since their 2009 triumph in the Champions League, the Catalans have won the coveted trophy twice and have reached the semi-finals on three occasions. Interestingly, this season when they were drawn in the same group as Pep Guardiola's Manchester City, the purists could not help but get excited at the prospect of Dr Frankenstein going back to visit the monster that he had created. However, in the first leg, held at the Camp Nou, the monster hunted the master down with a 4-0 win, but most people will agree that score did not do justice to the performance put up by both sides. Defensive errors and easy misses made the scoreline appear better than it actually was for the Catalans. Having said that, Guardiola made the same mistakes that led to Bayern Munich's elimination from the competition a couple of years back. He is still trying to beat Barcelona at their own game. It's inexplicable when you see that squads better than City's have tried to hassle Barcelona into submission and failed miserably. Even though the shift City put in at the Camp Nou was admirable, there was never going to be a different result. Maybe the scoreline would have been a bit more respectful had Nicolas Otamendi not had a shocker of a game, but he would still have wound up on the losing side no matter what. Guardiola opted to drop striker Sergio Aguero for an extra man in midfield and played Kevin de Bryune as a false nine. The City boss tried to press his former team in the final third, but with the deep lying midfielders not backing up the forward players it was all in vain. After the half-way line, City's pressing was non-existent and Barcelona just picked them off one by one. Although City almost matched Barcelona in terms of possession, the difference between the chances created was immense, and Claudio Bravo's moment of madness did not make it easier for the blue half of Manchester. The gap between the front three and midfield-three was immense, at times there was a distance of over 30 metres between the players. You cannot expect Barcelona to not punish you if the tactics you deploy are so naive. However, history does hold precedents of clubs triumphing over Barcelone – albeit in different degrees and with different methods. The first team to knock Barcelona out of the European Cup, post-2009, was Jose Mourinho's Inter Milan. The two sides had met in the group stages where Barcelona had claimed a 2-0 victory over the Italians after a goalless draw in the opening round of fixtures. When the two sides met in the semi-finals, Barcelona were considered heavy favourites after beating Arsenal 6-3 in the previous round. Inter had claimed an English scalp of their own in the shape of Chelsea but were considered as outsiders when it came to facing the defending champions. In the first leg, held at the San Siro, Mourinho opted to start the game without a single winger in the starting 11 with a 4-3-2-1 formation since Barcelona liked to play through the middle rather than cross the balls in from the wider positions. The Portuguese packed the centre of the pitch with five players excluding the full backs. After the first two games in the group stage, Mourinho realized that he did not have the legs in the midfield to go chasing the ball around. 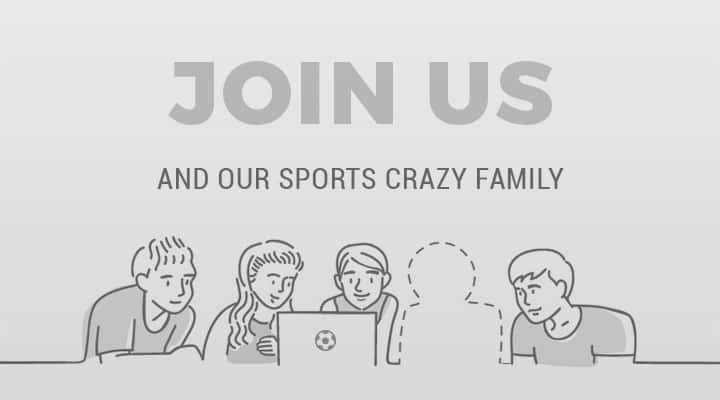 What he did have was experience in the form of Lucio, Estaban Cambiasso, Walter Samuel, Maicon and Javier Zanetti. Barcelona faced virtually no pressure in their own half, apart from when an Inter attack had been broken down in the final third. But as soon as the ball crossed the half way line, the Inter players were within two to three yards of every Catalan on the field, putting in tackles and making quick interceptions. When they would win the ball in their own half, Milito made runs into the channels and more often than not, he was the outlet. Milito was caught offside no less than five times, but when he did receive the ball legally, it was Eto'o and Sneijder's job to provide the support for the lone striker. If a defensive player ventured off on an adventure, one of the central 3 would take up the vacant position so as to maintain the shape of the system. Even though Barcelona scored first through a Pedro goal off a Maxwell cut back from the left wing, Sneijder, Maicon and Milito made sure that Inter went to the Camp Nou with a substantial lead. The Italians restricted Barcelona to taking shots from distance, and in goal they had a very experienced Julio Cesar who hardly had to make a difficult save. Inter ended up losing that game 1-0 but went through to the final by an aggregate score of 3-2. Barcelona claimed their second Champions League crown in three years with a win over Manchester United in 2011 before being knocked out by a resolute Chelsea defence the following season. Even though Chelsea defended brilliantly, Barcelona created a host of chances including a penalty. On the day, Chelsea were good tactically, but luck played a major part in the English club's first major European success that season. In the 2013 season, after struggling against AC Milan and Paris Saint-Germain, Barcelona were drawn against Bayern Munich in the semi-finals of Europe's elite completion. The game will forever be remembered for Jupp Heynckes' masterplan that restricted Barcelona to just two shots after 90 minutes. Had Manuel Neuer taken off in the middle of the game, no one would have noticed. 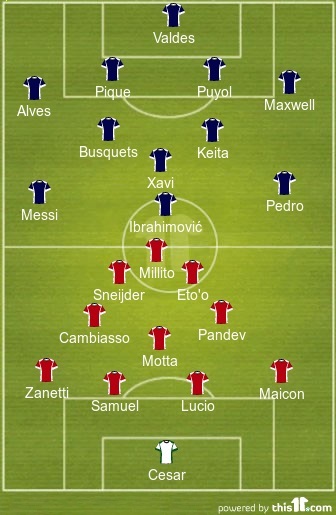 Bayern started with a 4-2-3-1 formation with Mario Gomes leading the line in the absence of suspended Marko Mandzukic. Bayern used the same technique that Mourinho had successfully used three years ago. They let Barcelona control the ball in their own half, but as soon as the Catalans entered the Bayern half, they were closed down quickly. 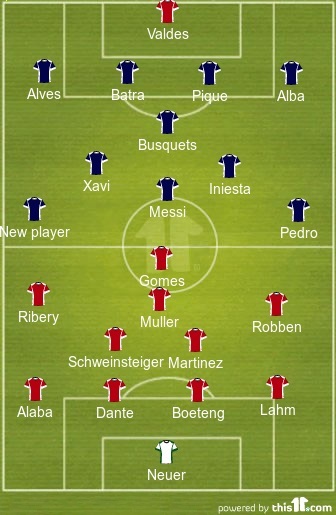 Heynckes had identified Andres Iniesta as the main threat, and Javi Martinez was deployed to specifically stop the talented playmaker. In the first half alone, Martinez committed 6 fouls on Iniesta - not letting the player turn without making Iniesta feel his presence. 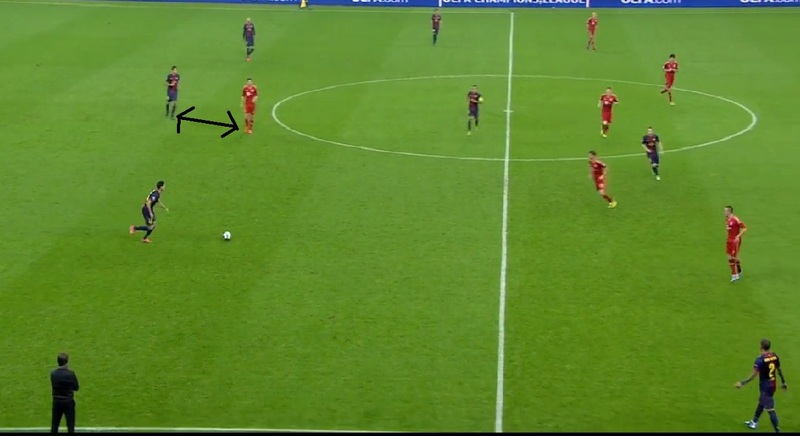 In the event of a counter-attack through the middle, one of Bayern's wingers dropped into midfield to create two banks of 4 and 3 to snuff out any danger. Gomes was given the responsibility of making life difficult for Sergio Busquets, and the striker made no mistake. Like his teammate Iniesta, Busquets found it extremely difficult to generate any momentum. 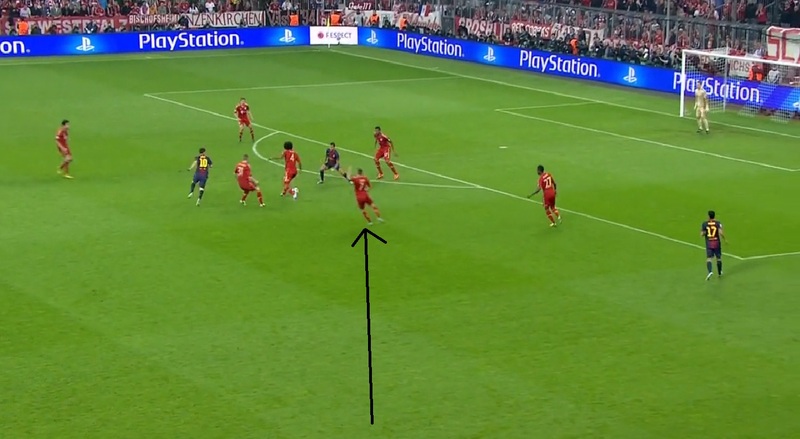 Gomes wasn't just selected as a "false defender", Bayern came in with a very clear offensive gameplan as well. It was a well-accepted fact, at that point of time, that Barcelona struggled from set pieces due to the lack of height in the team, and the plan worked like a charm as the first two goals of the game both came off corners. Bayern won the game 4-0 with goals from Gomes and Arjen Robben sandwiched between a Thomas Muller brace. Heynckes used the same technique in the Camp Nou as well, and the result was the same. The only difference - the final score read 3-0. In the 2014 season, Atletico used the Chelsea bus against Barcelona in the Champions League and came out on top, but again, there were a number of factors that made it possible. Messi had been out of form the entire season. For the first time in his career, he was criticised for being lazy by the press, and when Atletico won the league all hell broke loose. Gerardo Martino was sacked, and in came Luis Enrique. Messi and Neymar were joined by a certain Luis Suarez to form the much fabled MSN. Following a defeat in the Copa del Rey to the Catalans, where Enrique used Atletico's counter-attacking strategy against them, Simeone realised that the team needed to attack with more pace and not try to close Barcelona down every time they could but to choose their battles more carefully. It wasn't just Messi and Neymar to contend with now. Suarez was a bigger threat as he had the capability to make runs in behind a defence - something that Messi and Neymar did not do too often. As a result of this, Simeone laid out a perfect plan for his team where every player knew exactly when to close down and when to sit back. On most occasions, he used the midfield press strategy, but with Simeone's tactics, there was a twist. If the number of opponents in the final third were higher than the number of defenders, Atletico just maintained their shape. However as soon as Messi or Neymar dropped into midfield, a swarm of Atletico players would start pressing higher up forcing an error and recovering the ball. As soon as they got the ball, the full-backs would rush up-field. Since Barcelona had Messi and Neymar on the wings, both players not known for dropping back to fulfil their defensive duties, Simeone exploited this fact. Antoine Griezmann's first goal was testament to this tactic as the ball was crossed in from the right wing by Saul Niguez, with Alba being occupied by Juanfran. After the goal, Atletico dug deep to defend but created better chances, on counter-attacks, getting more shots on target than the Catalans who enjoyed 71% of the possession. Atletico put the game to bed off a typical counter when Filipe Luis' cross, after a long bursting run, was handled in the box by Andres Iniesta. Griezmann comfortably slotted the spot-kick home to send Atletico into the semi-finals. But it wasn't their attacking abilities that got them there. It was their defensive prowess. Even if Atletico found themselves in a position where the opposition looked favourites to score, they would quickly pick up a man to mark leaving the player with the ball without too many options. Since they were sitting pretty deep in their own half, it was difficult for a striker to get the ball while facing the goal - and if it happened, MSN were quickly closed down before they could get their shot away. In the entire game, Barcelona managed just seven shots to Atletico's eight. While you can see why Guardiola will never want to play the "Atletico way", his current tactics have not brought him much joy. While pressing higher up the field is something that he prefers doing, unless the midfield joins in as well, he will struggle to impose his tactics on the game. Currently, he does not possess the player to play "Tiki-Taka", and it would not be the best call to try the same tactics against Barcelona twice in three weeks - it didn't work with Bayern, it certainly isn't going to work with City. If he loses this game, he might face the task of beating Bayer Leverkusen away to qualify for the next round. 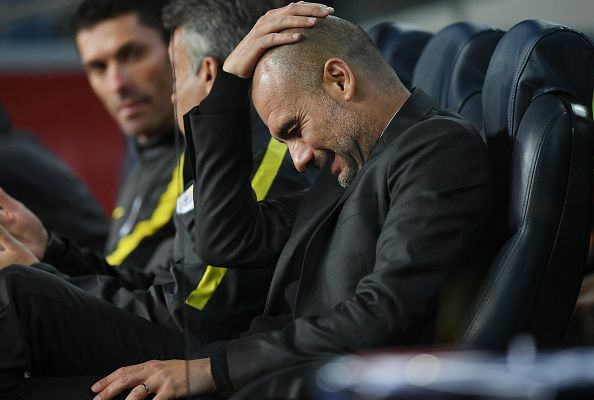 Guardiola needs to make a few adjustments for his team to have a fighting chance tonight. 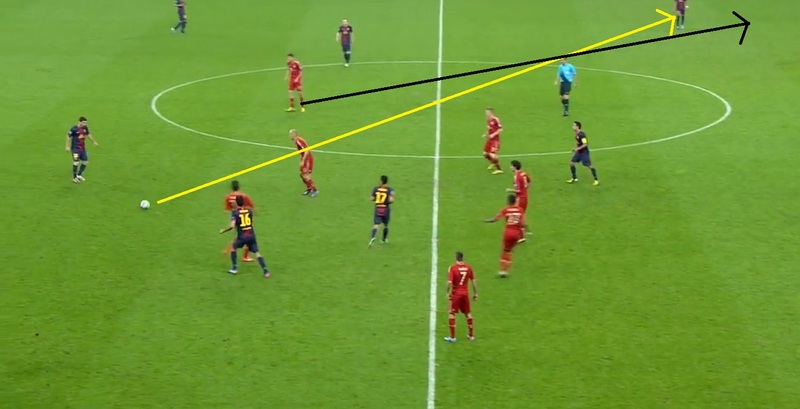 Firstly, by pressing higher up the field, he gives Barcelona more space to operate in. A single through ball would be enough to destroy the entire City set-up, and with the kind of quality the front three possess, it is only a matter of when. Winning the possession war will not win him the points he desperately needs right now, which leads us to the second point. Sergio Aguero has to start. There is no way City will win against a Barcelona team with their best player watching on from the bench. Aguero's work-rate has increased immensely since the arrival of the new gaffer at City. The Argentine who ran around 8.5 kms/game last season now runs close to 10 kms a game. The best way to score against Barcelona, apart from set-pieces, is on the counter and without an out-and-out striker, that is a very hard target to achieve. 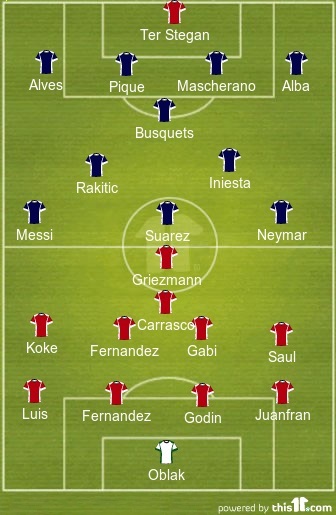 Lastly, the Catalan manager has to play a "proper" defensive midfielder. One who does not mind getting his hands dirty but does it without any rash tackles just to stop Barcelona from building any sort of momentum. Fernando would have been ideal for the job, but the absence of a right back in the City squad might mean the job falls for Fernandinho. The Brazilian needs to sit back and protect his backline and the space between the midfield and defence. In the last game, Barcelona were able to find the pocket of space in the middle of the park and create chance after chance in the second half, and that cannot happen again if City want a positive result from the game. If Otamendi doesn't have another shocker and if Pep gets his tactics right, Manchester City would actually be the favorites tonight considering the injuries in the Barcelona back four and the absence of Iniesta.